An interesting article from m Readers Digest. 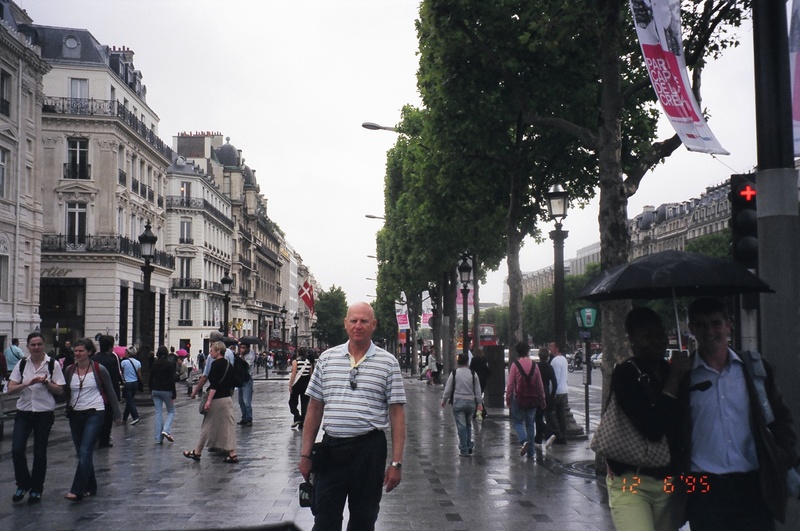 I have done 3 of 10 listed, Bourbon Street in New Orleans, the Champs Elysees in Paris and Abbey Road in London. How many have you done? New Orleans is poorer in its music scene this week. Coco Robicheaux, (real name Curtis Arceneaux) mainstay of the local music scene passed away at the age of 64. He apparently suffered a heart attack at one of his favourite spots, The Apple Barrel on Frenchman Street in the quarter. He played there on a regular basis. A self taught blues guitar player, Coco began his career on Bourbon Street at the age of 17. As the story goes, he found his first guitar in pieces on the street. He repaired it and began learning to play. It worked well, as he became a top tier player in New Orleans. In his career, he recorded 6 albums and appeared on several TV shows and movies. He recently appeared as himself on an April 2010 episode of “Treme“. Speaking of “Treme”, this is a must watch show, seen on HBO and HBO Canada. Attached track is a song called “Cottonmouth” and features Coco on guitar and Hubie Vigreux on percussion. It was recorded live at a blues bar in Hawaii. Safely back in Calgary it is time to summarize, review, price and recommend. First the beginning, the flight from Calgary to New Orleans. We flew via Continental Airlines, with a connecting flight in Houston in both directions. We chose Continental for a couple of main reasons. First, they had the flights that fit our need, second, they are connected with Air Canada, which allowed us to earn Aeroplan. Total cost for flights was approximately 650 each, return including luggage fees. The flights were on time (early on the return to Calgary). I had two issues. On the way down they ran out of hot food for purchase, which was a downer on a flight that I had to at the airport for at % in the morning. Second, in-flight entertainment did not have a free option, only pay. Overall, I would easily fly with them again, especially knowing what to expect. There is an app for Iphone as well. 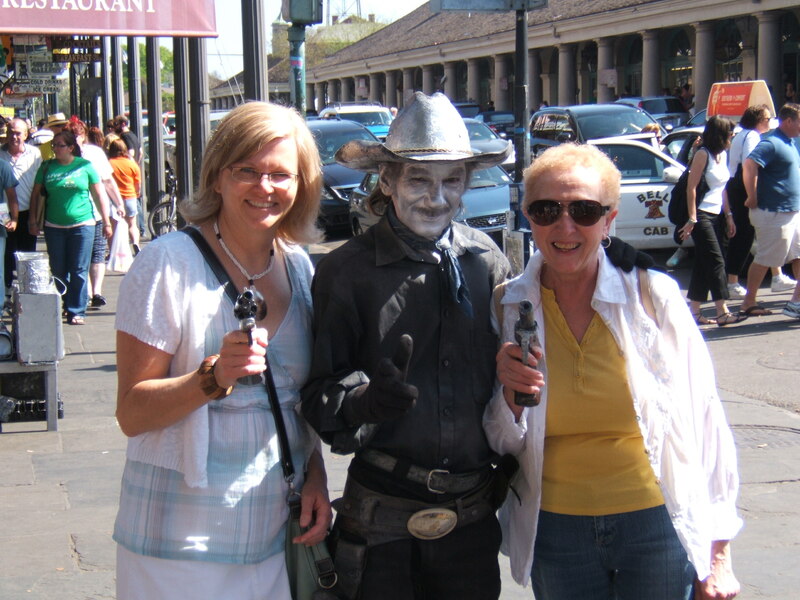 Lots to see and do in New Orleans. 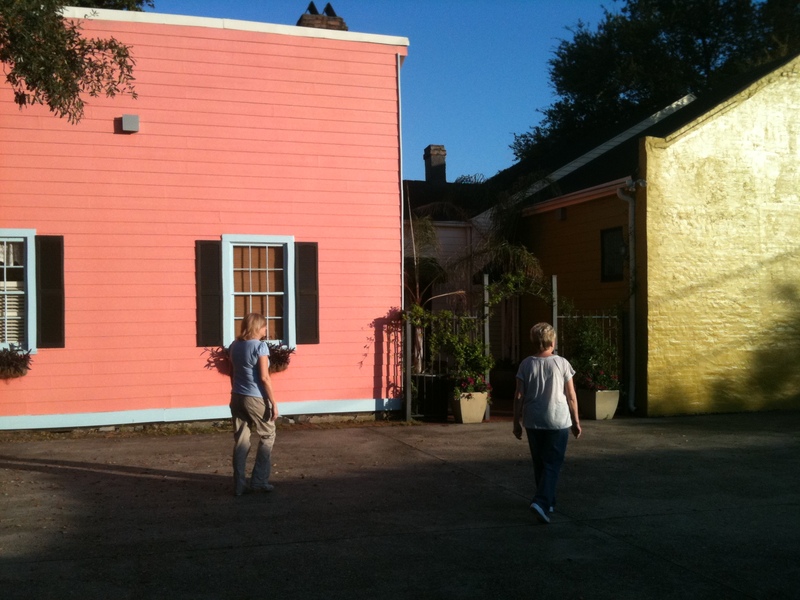 we spent 3 night at Garlands Guest House and Creole Cottages. This is a bed and breakfast about 100 feet off of Rampart Ave, right beside Louis Armstrong Park. We paid about 150 per night and the accommodations and breakfast were very good. I would rate it 4 of 5. I would double-check the rates etc. as the place had been sold, with new owner operators taking over on April 1. We were there on the 27th of March for our last night. Great little restaurant. Easy 4 out of 5. Reasonably priced and bring your own booze. we highly recommend this place. The service was great, the food reasonably priced and very well prepared. If in New Orleans, you have to go here for at least one meal. At least 4.5 of 5 stars. Average place, a little pricey for the quality, but a nice place to sit if you can get balcony seating. Pleasant staff. RUN AWAY. DO NOT EVEN THINK ABOUT EATING HERE. We popped in and out of several other places, but these stand out. Bourbon Street is full of bars and music, we enjoyed the House of Blues, with Rafael Saadiq and the Funky Pirate with Mark Penton and the Pentones. I look forward to maybe getting back here again some day. We cruised on the NCL Spirit (Norwegian Cruise Lines). This particular cruise line does free style cruising, meaning that there were no set dinner times and tables and dress was casual. The service was what you would expect, top-notch. If we had any issues, it was with the entertainment. Very low quality and we did not enjoy it. We tended to ignore it. Other than that, there were lots of activities on board to keep us occupied. I can easily recommend this cruise company. Overall cost was about 1200 per person after excursions and extras, and we didn’t feel ripped off at all. Boat Blast and Snorkel. This was entertaining, driving a 2 seater out into the ocean to a portable dock and then snorkelling the Belize Reef. This was a good excursion as it was not to strenuous and involved a 40 minute bus ride, which gave us a view of the area. I would recommend this as suitable for most as you do have to snorkel and there is a beautiful beach to spend some time relaxing on. A 37-mile drive along the Western Highway brings you to the Caves Branch River and its winding path, through the Maya Mountains and numerous ancient caves once inhabited by the Maya. Upon arrival at Caves Branch National Park, you head out for the caves with your equipment. This excursion was the most interesting part of our trip. The drive was good as again we had the opportunity to see the countryside and a bit of Belize City as well. Suitable for all, you can get wet, so protect your camera. Tabyana Beach & Gumbalimba Park was the excursion we picked. A great day, suitable for all, The park was fun, with parrots and monkeys o interact with and many picture opportunities. the Pirate cave was a bit lame. Tabyana Beach beach is spectacular. The nicest spot on the whole cruise was Roatan, and we will be back for sure. Cozumel by Jeep and Snorkel was the tour we chose. Awesome tour guides. I would say that this was the fullest day we had. We drove to Punta Sur Eco Park, Cozumel’s unique Ecological Reserve. We saw salt water crocodiles close up, a lighthouse, Mayan ruins and a spectacular Corona commercial beach with awesome snorkelling. The snorkelling was strenuous but the rest of the tour was suitable for all, and if you didn’t snorkel, the beach was there. And that was our trip. We enjoyed the company, and we enjoyed the cruise. I was skeptical, but would do one again. We woke up to a beautiful day. We went and ate our breakfast, which is one of the best parts of B&B’s. One gets to interact with the other guests in a casual setting, usually seated at the same table. On this morning we met a couple from Spain, who were living in Chicago. Nice people, enjoying the USA. Finished up and headed out with John and Cec. Big day planned, lots to check out in the Quarter, then the House of Blues for Rafael Saadiq that evening. We headed straight for the Bourbon Street area, a massive amount of people. The bars never close in the Quarter, literally. 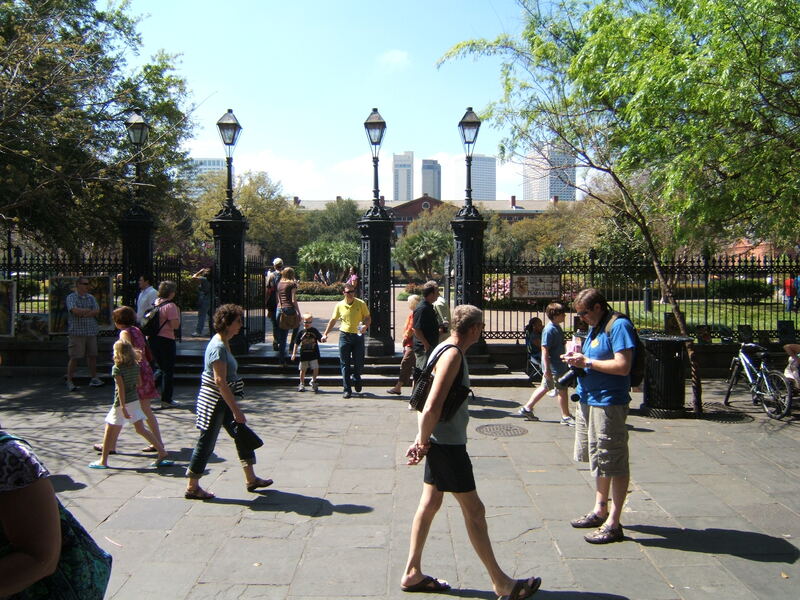 After exploring, we ended up in the Jackson Square area, a focal point of the area. There are a large amount of street vendors etc in this part of town as well as entertainers. This type of “Busker” entertainment is everywhere. We have seen in almost every place we go, and is an interesting way to earn. Busking is a fine art these days, the good ones are very good, then there are the ones who are not so good. At any rate, Lori and Cec enjoyed the show and we were off. We made it at least half a block before we decided to do a buggy ride through the Quarter. These are pulled by Mules only by civic law as they handle the heat better than horses, apparently. I will have to take their word on that. The tour was interesting and informative. Cost was reasonable ($15 American per person) and lasted around 45 minutes. 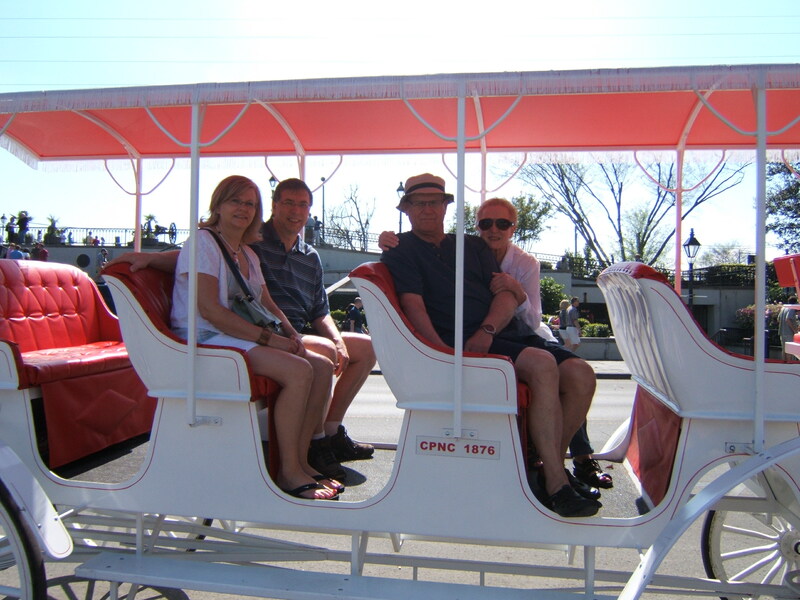 As a rule, we like to do these types of excursions in new places as you truly get a feel for the touristy stuff and quickly figure what and if you want to see something close up. We left the restaurant and carried on, hitting the waterfront and watching commerce flow on the Mississippi. BIG river. We continued our stroll along Decataur St. and headed for the B&B to prepare for the evening. We departed and grabbed a cab to head to the House of Blues and supper in the area. http://www.houseofblues.com/venues/clubvenues/neworleans We ended up ditching the cab as there was a parade and one could not get from point a to point b unless one walked. According to the driver, the French Quarter continually has parades, making it very difficult to get around. So we walked. Ended up at a run of the mill pizza joint, ate then started over to the concert, when sure enough, a parade blocked our way. This was, I think, a Shriner thing, lots of motorcycles, lots of dune buggies, and of course people throwing beads. Lori got some beads, which kind of rebounded off her head and appeared to be thrown from a passing dune buggy. Finally, we made it to the concert, went inside and found a great spot to watch an absolutely spectacular band. Rafael Saadiq. Funny story, we booked this trip and were listening to music. A song came on by Rafael, and we both thought, I wonder if he is playing while we are there. A quick search and yes, he was playing. Needless to say, we jumped on that in a hurry. In the video I took, I apologize for the sound quality in places. I suggest turning it down a bit. I-phones and bass guitars don’t mesh very well. Having said that, and it is not that bad, pay attention to the 2 backup singers. They went hard for 2 hours, definitely in great shape, and great singers as well. And that was then end of our day, wandered back through party central, it is crazy along Bourbon St and headed home. Big day on the next as we were going cruising, and Gord and Cheryl would be here now. Supper eaten, wine drank, conversation done, we headed back to the B&B for a well deserved rest after a long, long day. Must rest up for the next evening – Rafael Saadiq, and a long day in the Quarter.